Today I would like to share Part 2 of my review and comparisons of Dior's new gel shine formula with you. After this post, i was considering to compare nail polish brushes of different brands, please leave a comment if you think that would be helpful. As I stated in my previous post (Part 1), the new brush is very close to Gel Effect Top Coat brush. At Part 1, I presented you some cheerful colors, here comes taupe & grey: #403 Palais Royal, #803 Metal Montaigne and #494 Junon. EDIT: Before I even released this post, there were questions regarding the brush of the new Dior nail polishes, so I managed to get a photo for you below. New Dior brush is close to YSL brush, thiner and a tad longer than old Dior brush but still it is wider than Chanel's. Hope that helps. #403 Palais Royal is a mid-toned taupe creme. It is not warm nor cool, which makes it more interesting for me compared to the older taupe of Dior, Trench. Because of this slight coolness once compared to other taupes, I find Palais Royal more modern. The formula is great, it is opaque with two coats, below it is swatched without a top coat. I like taupes on my tips, so here is an extended comparison. Chanel #559 Frenzy is lighter, Armani #104 Greige is also lighter and cooler. Dior #306 Gris Trianon is lighter and slightly cooler. YSL #39 Gris Gallery is lighter and a tad warmer. Armani #105 Taupe Greige is the closest of the bunch but it is a tad more mauve. Chanel #505 Particuliere is warmer and slightly darker. Dior #223 Trench is warmer, therefore for me the new shade #403 Palais Royal is a modernized version of Trench. Talking about grey, #494 Junon is a mid-toned bluish grey creme. The formula of this one was also great, not too thin nor too thick, self-leveling and opaque with two coats. It appears very blue on the photos but I found it to be more grey in real life. I also swatched it against some blues later on and have seen that Junon was looking more grey. 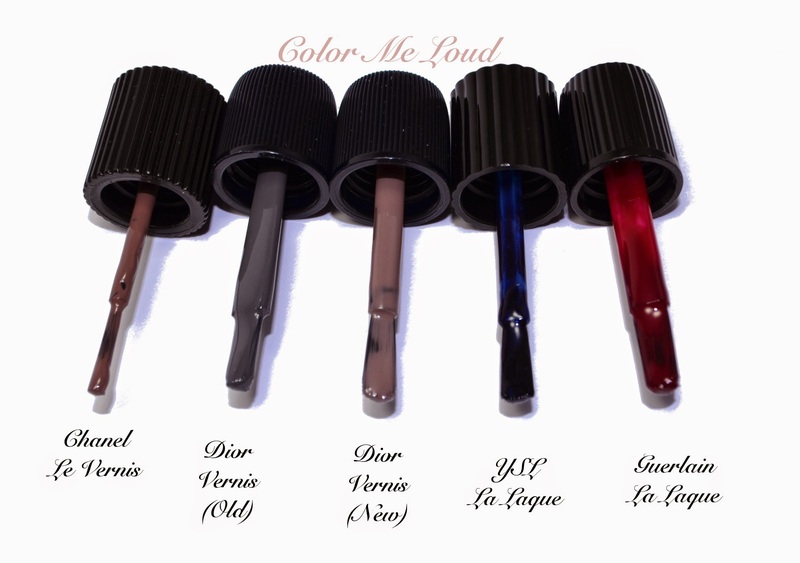 To me Junon is one of the modern and edgy shades of the new Dior nail polish line. Dior Metal Montaigne is close to Chanel Steel but definitely is a revamped version with a prettier shimmer. Chanel Black Pearl leans more blue, Dior #072 Metallic Silver is more metallic, less pearly. Dior #497 Junon leans more blue than Dior #707 Gris Montaigne. YSL #38 Gris Underground has a similar blue tingle but is much lighter. Burberry #203 Storm Grey is also another blue leaning grey which is darker than Junon. I am going to review three more shades soon, which are on their way to me at the moment. Dior Couture Colour Gel Shine and Long Wear Nail Polishes are already available internationally and retail around 23€ for 10 ml. Oh I'm digging Palais Royale for sure! Thanks for the swatches, Sara! Yes! Palais Royal is gorgeous. I was wearing it last week and I really liked it. I love all three!!! I don't know how they did it, but somehow they transformed me into a nail varnish lover with these new beauties :) :) I checked out few more shades but I got some £5 off vouchers, so will use them at least :D I love your nails. They are so perfect and long!!! Vouchers sound great! Which store gives them? We get them here as well, like 5 EUR ones and it is always a bad argument not to shop after having them lol. Oooh, these look so much prettier on your nails than in the bottle. I especially love Palais Royale which is interesting because I usually shy away from those shades. Going to need to check out Junon in person, i dont think I have a similar shade. As much as I love the others, I already own similar dupes. Must stop the temptation. I think Palais Royal is also unique in a way. I find it to be a unique cooler taupe which is a modern version of Particuliere. I'm so excited! Thank you so much for your post and the picture of the brushes! I LOVE YSL brushes and I love Dior formula so I'm excited about the fact that Dior improved their brushes! Yay!! yes Junon is the most unique shade I think, I like greys, I like blues so that one is love for me. I think they look nicer on the nails because of the finish, it is very shiny almost to the point being like a mirror, which makes it very pretty and lively as opposed to being dull. I think their wide rounded brush is amazing. First time I opened the bottle and saw it I was startled and thought 'how I'm I ever going to use this ???' But it turned out to be so much easier for me to apply than with many other brushes. I live in Tenerife at the moment and unfortunately, they don't seem to have the new Dior gel effect polishes yet ;-( CANT WAIT !!!! Can't wait for your swatches for the other shades ! Hi Sara, thank you so much for your answer. Yesterday I swatched Dior Nuit 1947 at the counter and I guess it was still from the older line. Nevertheless it was still extremely beautiful and the formula was great. I really fell in love with it and had to show a lot of self control in order not to buy it ;-) after hearing so much good stuff about the new formula, I might as well wait for the new Nuit 1947, right ? They are all so pretty but the one that stand out most to me is the Metal Montaigne. I super like the color and coverage. I find it classy and perfect for any occasion.